In today’s world, every day we witness a new attack on website done by professional hackers. While hearing such news, you cannot help but think whether your website is secure from such attacks. Recently DDoS attacks on Twitter, PayPal etc are few of the cases to suffer their app and websites. 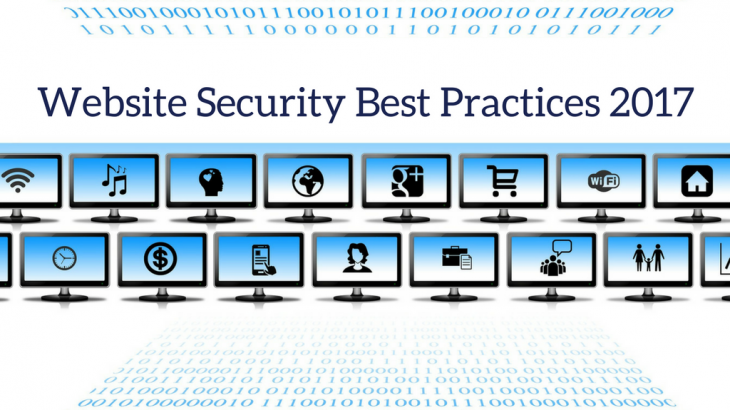 There are countless numbers of solutions for securing your website but sometimes these website security best practices 2017 can guide you to tackle these attacks. Infact they are importantly some simple and easy practices. It is very much essential to keep all the softwares and scripts updated in order to maintain website security. Hackers are always in search of a way into your website. New patches of softwares keep coming to overcome the old vulnerabilities and hence tracking the software updates and keeping your website updated is very crucial. Never use common username passwords for any of your system. Here are some easiest passwords for hackers to guess and misuse your system. Maximum DDoS attacks take place due to usage of default passwords for devices as well as systems. Thus easy and default passwords are very much prone to easy security breach. Make a habit to have long, complex and unique passwords. Use of SSL Certification can be promoted. It secures the web communications which will reduce the chances of hackers gaining access to you personal data and login credentials. When we have multiple sites to host, it is very tempting to host all the sites from one server itself. But this is the easiest way for hackers to enter the system. Once he gets access to this server system or one website, he can infect all the sites and servers. Not only the attack surface increases but also the cleanup process would become much more complicated and time consuming. Monitoring server logs continuously can be helpful in drawing in a lot of information. Analyze this data daily in order to identify threats. It will help you to detecting attacks earlier and then enabling yourself to defend against them. If you see a sudden raise in traffic from all the IPs of area irrelevant for you, then there are chances of detecting such attack and taking actions at the early stage itself by monitoring the live Activity usage of your website. Always keep your firewall active. Never activate all the ports unnecessarily for any other system to access. Firewall will not only increase the website security from hackers, but also block spammers and malicious bots. It will secure all the communications between your website server and the Internet. In this digital world one event can lead to a catastrophic condition of loosing entire data in one shot. Hence backing up your site and data regularly is one of the best practices in web security. Many content management programs have a feature to backup your site and databases automatically at fixed intervals, this can be used in order to improvise wesite security. Doing this will help in protecting your data, in case you lose them. So these are some simple easy website security best practices in order to increase your web security significantly. While these practices don’t guarantee that your website is non-vulnerable, but many automated attacks and overall risks can be brought down dramatically.